- Social media is no longer one person"™s or one team"™s job. On average, 29 people are participating in social programs within an SMMS across 11 business groups and 51 social accounts. Gone are the days when one social champion or social media team is expected to "own" all social activity. The trend is to activate more people to have more targeted, relevant conversations. 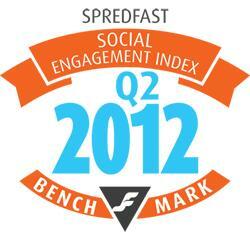 - Companies are expanding social engagement opportunities through increased publishing and activity. Companies published an average of 4,924 messages over the quarter, averaging engagement of 2 million interactions during Q2 of 2012. These messages, or social content, each provide new opportunities for audiences to engagement with social brands. These messages, or social content, each provide new opportunities for audiences to engage with social brands. 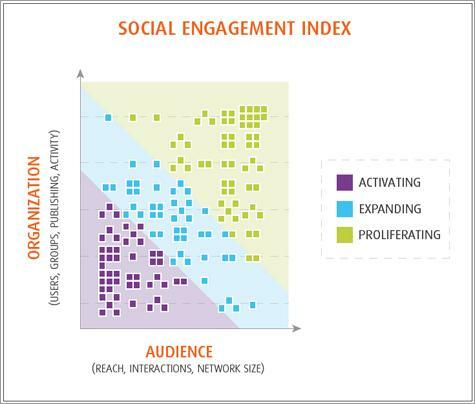 While quantity doesn"™t equal quality, the Social Engagement Index shows that as brands increase contributors, groups, and activity their external engagement rises disproportionally. - Social is allowing companies to communicate directly with an "opted in" network. Companies have an average social network size of 1.8 million people, potentially reaching 47 million impressions over one quarter. Pair the increasing pace of audience acquisition with a high level of activity, and brands are increasing the chances of being seen in coveted news feeds. - Publishing is heavier on Twitter, engagement is higher on Facebook. Companies are publishing nearly three times as often on Twitter compared Facebook. 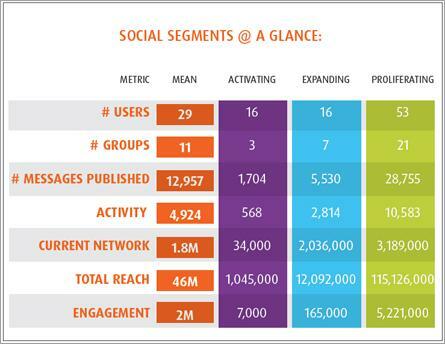 Yet Facebook yields 9x the engagement for each message published. However, some brands found the opposite, highlighting that determining goals and audience preferences are mission critical to success. - Corporate social programs are multi-channel, requiring employees to participate in multiple roles. It"™s no longer a debate on which one network to adopt. Companies are utilizing at least three social networks and assigning up to five levels of roles to employees to allow the right people to focus and engage their audience in the best way. WHAT DOES IT MEAN FOR SOCIAL BRANDS? The report is chock full of data and insights. And while there"™s more to be said for each specific area, a few key opportunities and takeaways emerged. Engagement is the name of the game. Social brands are vying for both placement in a news feed and validation that their audience is actually actively participating. These interactions - Comments, Retweets Likes ,Clicks, etc. - prove message resonance and relationship intent with a brand. Orchestrating the outliers. The truth is, a good percentage of brand activity is still being published natively or through disparate applications. Meaning: brands have an opportunity to "reign in" social accounts, content, and users currently active outside a centralized system. Without this, aggregate reporting, orchestration, and brand protection oversight are nearly impossible. Technology is a friend. How can a brand be efficient with 29 users, 51 social accounts, and publishing around 50 messages a day? Similar to how Content Management and Marketing Automation Systems help coordinate, centralize, and measure other communication efforts, the exponential growth of social business is emphasizing the need for technology like an SMMS. Low hanging fruit, ripe for the picking. Personalized approach and goals aside, tactical opportunities surfaced as opportunities for social brands. - Content. If engagement is the name of game, content is the secret weapon. Ensuring that messages appear in a user"™s news feed so that they can engage depends on the fact that your content is compelling and resonates. - Contextual insights. Great moments in engagement are exciting. But realizing how to learn from these and optimize for future content is key. Findings ways to use labels and add context to social activity helps percolate up insights. - Segmentation and focus. Your audience wants more, quality activity. Getting the right people internally (your 29 users) sharing the most relevant and targeted activity with your external audience allows brand to stop marketing by megaphone. - Coordination. It may not be an attractive area of focus, but it"™s crucial. 29 users across 51 accounts that need to respond to 2 million user interactions each quarter signals the need for concerted coordination and internal planning. What content does each user focus on? Who will respond to what? What is the escalation process? - Conversion. Not all engagement is equal. And interestingly enough, the data showed Clicks outperformed any other interaction type. Regardless of industry, brands have a keen opportunity to actually convert social users from a social site to a corporate website, landing page, or even point of purchase. The world’s best social software platform. We deliver smart social software that makes every consumer touch point better.